September has finally arrived and with the night’s drawing in and the air temperature dropping, it means one thing, it’s time to get out on the river and start seriously targeting barbel. If you’re looking for some guidance on how to approach a river and the tactics and baits used to land yourself a monster then why not book me for a day. Prices are very competitive and you will leave full of confidence on how to tackle your local river and proceed to catch more than your fair share of fish. If you are interested then now’s the time to learn as once October and November arrive (in my mind the best months) the fish will be feeding in earnest. For more information simply email me at duncancharman@me.com or give me a call on 07928 617006. Zander fishing at Old Bury Hill. Many of you will have heard or read that things are going to change at Old Bury Hill over the next year or so. Details of exactly what’s going to happen haven’t been finalised, yet one thing is for sure, if you are not a member then you won’t be able to fish the venue. I’m not sure exactly what the price will be but it will be around £25 after which you will book and pay every time you visit and fish. If you are interested then take a look at their website as you can register to become a member there. In the mean time if you have ever considered fishing for the zander and would like to be guided then this may well be your last opportunity and without a doubt October is by far the most productive month, so why not treat yourself and be guided by myself. Prices are extremely reasonable and include the luxury of fishing a few hours into darkness. Well what a month August was in terms of weather, rain, rain and more rain. I really can see why lots of Brit’s immigrate abroad to Australia and New Zealand now as this month was just depressing. Couple the crap weather with a four week tooth ache and I’m really glad to see the back of August and with the nights becoming chilly it really is time to start putting the time in on the riverbank and placing the net under a few big barbel. Looking at the diary inputs I’m really not surprised to see that my personal sessions on the bank, five in total accumulated to just twenty-nine hours in total. The guiding session also totalled five with thirty-nine hours spent bankside and feature sessions again totalled five and twenty-three hours. September has now arrived and with the chilly nights it’s not just us anglers that will be feeling this, the barbel will have noticed this and although it’s still slightly early they will know that winter isn’t far away. The natural food that they have lived on over the past few months will be decreasing with each passing day and it won’t be long for the weed and bankside vegetation to start turning. For the specimen angler the next few months are exciting times as all species will start to switch over to our baits, pack on the weight and grace our nets. For me species such as barbel become my main target along with the odd after dark session for crucians. Zander at Old Bury Hill are also on my mind as October is by far the best month and although I wasn’t intending to spend too much time for these this year, with the venue destined to switch to a members only venue in the near future then it just has to be done. If you are interested in the zander at OBH and need to be guided then next month maybe your last opportunity so send me an email and let’s get a few dates in the diary. It’s also a good time to learn a few edges that will put a few extra barbel in your net so if you need some help, now is the time. Contact details – email duncancharman@me.com or call 07928 617006. 03/08/15 – Up early in order to get on top of things and the first job was to write up and collate images taken from the visit with Dean Lock at Monks last Friday. I wasn’t expecting to complete and forward this to Anglers Mail but come midday it had gone giving me plenty of time to get sorted for another Venue Expert, this time with Alan Muller on the Loddon come 3pm. A frustrating evening as the top stretch at Stanford has at least five anglers on it so headed downstream to the harder lower beat. Fishing till 11pm it was far from easy but finally we managed to get the job sorted. 04/08/15 – The best part of the day was spent compiling the text for the Loddon Venue Expert. Hopes of heading to Frensham were dashed when my internet connection went down and once the problem was detected, a hardware problem, I decided it was time to start backing old files up and transferring things to a slightly newer laptop. Unfortunately though I’m still having problems opening emails on my Mac so things are far from perfect at the moment. 06/08/15 – After getting all the bait and terminal kit sorted for the Barbel Teach-in headed to the Loddon at Stanford to meet six anglers in the hope of catching a barbel or two. The conditions looked good and a few fish were caught. The whole write up can be seen in a previous post on my website. It’s always good to get some feedback; here are a few words from one of the anglers that attended –Thanks for your time and sharing your vast knowledge and experience with us. I’m sure we’re all better anglers for it. Great Photo, still so happy with the P.B. Thanks again. 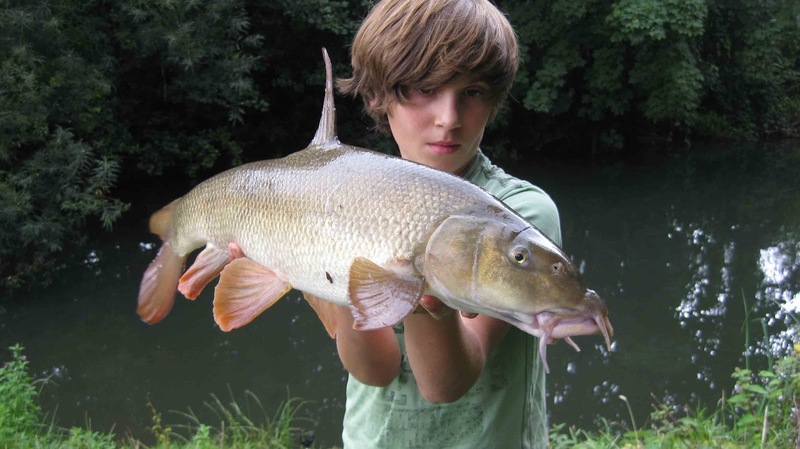 07/08/15 – Spent the morning backing up files from my old computer as well as writing a feature for Coarse Angling Today and FAS on the 3rd Barbel Teach-in. Come the afternoon I grabbed the barbel kit as it was my turn to bait the river and with a few hours to spare decided to cast a line as well. Arriving later than planned due to the skies clearing and temperatures rising I headed to the furthest swim and spent an hour fishing without any signs of fish before baiting this one plus three others on my way to the swim I caught a double from back in June. Not long after casting out and whilst on the phone to Dr Paul Garner I received a knock, yet fifteen minutes later, 9pm, the river came alive with fish rolling everywhere. Most of these were big bream but some weren’t and seemed to be slurping flies of the surface. I did notice that one had a flat head and almost resembled a big grass carp or pike so my feelings these were chub, however the length suggested not, so what were they? Unfortunately my tip remained motionless all the time this display went on, which was only for forty five minutes as I had to be gone just before 10pm to pick the girlfriend up from work. If I had stayed then surely a fish or two would have fallen, yet whilst they swirled all around me I remember smiling saying to myself, ‘I’m not going to get a bite am I’, but also saying, ‘thank you I now know it’s worth while continuing and my time will come’! 10/08/15 – Dropped off at Waggoner’s Wells this morning to put together a bag of roach on punch but although the first hour was OK with four roach around 14oz falling, come 9am the lake died and all that could be caught was small perch. With rain forecasted I decided to leave early and return tomorrow. Back in the office it was a day of getting things sorted now that my icloud account is back up and running as well as writing the text for a roach article for a European magazine. Come the evening and ahead of myself I headed to the river for the night. Once again the bream displayed and come 10.30pm after a recast and tweak to my rig the tip pulled round and I was away, although straight away I knew it wasn’t a barbel. The sheer weight had me momentarily fouled that a small carp was the culprit but then a bream showed itself before moving upstream and I remember saying ‘that’s big’ however I never imagined it to pull the scales round to 11lb 2oz! The action then slowed before another bite saw a skimmer landed, one around 7lb! That was the end of the bites and come 6.30am I was heading to the car. 11/08/15 – Today was all about getting a few bread punch articles sorted so I headed to Waggoner’s Wells where from 1pm to 5pm I put together around 15lb of mainly roach along with the odd bonus fish which included a 2lb purple crucian! 12/08/15 – First thing I headed to Badshot Lea to see how my dad and girlfriend’s dad were doing. I was expecting them to be struggling however both were catching bream around 4lb on helicopter rigs along with Mick’s standard carp of around 15lb. Back in the office it was time to finish off all the articles pending as well as the standard office jobs. 13/08/15 – Spent the day writing articles for Anglers Mail Blog page, adding a few things to my website and face book pages as well as getting the tackle ready for a day’s guiding tomorrow. 14/08/15 – Alarm sounded at 4am and arrived at Mill Farm Fishery at 5.45am to meet Mark my customer for the day. The day before had seen heavy downpours all day with localised flooding and with so much water going through the lake we knew it would either fish its nuts off or be difficult. Unfortunately it was the later with the carp very inactive till later in the day. The silver bream and roach kept Mark busy however it was a case of altering things constantly to keep them coming and come the end of the day he had put together lots of bream to over the pound and plenty of quality roach to 1lb 6oz plus the odd tench and maybe eight carp to 12lb. 15/08/15 – Keeping the barbel campaign going as visited the river and baited up. 17/08/15 – At long last the tooth that’s been giving me so much pain of late is being removed. Can’t say it was a very memorable occasion, 20mins tugging and pulling but its finally gone, just a few days of pain killers and hopefully back to normal. 18/08/15 – Filled to the brim with Nerofen headed to Broadwater as needed a catch image for an Anglers Mail feature. Can’t say it was a big success but not a complete failure as managed to get all the images needed to complete the feature in just a couple of hours. 20/08/15 – Well what can I say about today, just fantastic. Another early morning saw me finally arriving at the river Loddon at 8am to meet William and young Jake. It was a return visit to see if we could catch Jake his first ever barbel. How did we do, well if you keep up to date with both my Face Book posts and Blog entries you will know! 21/08/15 – Another early alarm call, this time 4.30am! This was basically to meet a friend on the river Loddon and catch a barbel for a feature which we achieved in our allocated two and a half hours fishing. Back home it was simply a case of checking the text file for the article, taking a couple of new images and sending everything to Anglers Mail. 24/08/15 – Another emergency visit to the dentist reveals I have a dry socket and now having to take antibiotics tablets for a few days. By the time everything was sorted it was mid afternoon so I decided to brave the wet weather and head to the river. Arriving at 5pm I was surprised that it wasn’t up and coloured and come 10pm the tooth ache was making the experience far from enjoyable and with no bites forthcoming headed home. 25/08/15 – After a lost day yesterday I made up for things today and managed to get plenty of words done for future Anglers Mail features. It would have been nice to get the images sorted as well but it’s been another day of rain and with this forecasted to stop in the early evening I met Chris to see if we could tempt anything. Can’t say too much on what happened as the last thing we want is to draw attention to ourselves by publishing our results, however stay posted as all will be revealed soon. 26/08/15 – With loads of articles and angling related things needing doing it was another day in the office. 27/08/15 – A morning in the office before heading off to Enton to see if the crucians were still feeding. Unfortunately just two around 2lb 8oz showed and this was from around two dozen fish caught which was made up of lots of small carp ranging from a few ounces up to around 4lb. As evening drew in I scoped the landing net through the margins and couldn’t believe that every scope saw around 50 one inch carp netted and as I wound in at 10pm I couldn’t believe that a two inch carp had tried to swallow my corn hook bait and was fairly hooked in the mouth. Worrying times I feel are in store for Enton over the coming few months. 28/08/15 – Today from 8am was spent on the banks of the river Loddon and I experienced one of those days we all get from time to time. I was hoping to create another video with young Tom so dropped into my banker swim first. Forty minutes past before a tap was noticed followed by the standard barbel three-foot twitch, yet disaster struck. For no apparent reason contact wasn’t made and I wound in a hooklink that had been cut off. Thoughts that a pike or chub may have swallowed the bait before biting through the hooklink (chub can do this using the crunching pads in their throats) or that I had a weakness in the link, yet this was a new hooklink and I haven’t experienced this before. The bite had barbel written all over it so I can only assume that the hooklink rubbed against something sharp like a stone or branch. Later I spoke to another angler who confirmed my thought that something sharp was in the swim as he too had lost a barbel in what he thought were tree roots. Obviously something has been washed down in the recent rains and become lodged within the swim, I just hope it moves on soon as without this swim catching going to be somewhat difficult. After covering some ground without any luck we headed into another field and soon after casting out the rod twitched again a few feet and a barbel was momentarily hooked before shedding the hook and leaving my rig in the bankside vegetation, again something that rarely happens. Amazingly next cast, in the same swim saw a repeat performance, yet this time it must have been a chub but again the hook came adrift. Come 3pm I had had enough so we headed to a nearby day ticket water to get a video created for Anglers Mail ‘Where to fish’ section, so at least it wasn’t a complete disaster. 29/08/15 – If I wasn’t knackered enough from burning the candle at both ends then today was going to be a long one as the alarm sounded at 5am! Meeting fellow Nash man Chris Petter at Marsh Farm at 6am we headed down to Essex, Rochford Reservoir to help out at a Nash ‘Get the kids involved’ day with Alan Blair. Fortunately the rain stayed away and a few fish were landed and all-in-all a really enjoyable day, apart from the drive home in the rain.